Brakes on 1855. something aint right? Posted: Thu Jan 10, 2019 11:47 am Post subject: Brakes on 1855. something aint right? I am rebuilding an 1855. I done the reared and transmission and am now in the process of putting the brakes together. Posted: Thu Jan 10, 2019 12:40 pm Post subject: Re: Brakes on 1855. something aint right? Was there supposed to be thin shims in there between the cover and housing or was that just some of the late ones with a mechanical actuator? Posted: Thu Jan 10, 2019 1:58 pm Post subject: Re: Brakes on 1855. something aint right? Are you sure the discs are the right thickness? If too thin that will cause the trouble you have. Posted: Thu Jan 10, 2019 2:48 pm Post subject: Re: Brakes on 1855. something aint right? Have you backed out the adjusting screw for the parking brake actuator? Posted: Thu Jan 10, 2019 4:36 pm Post subject: Re: Brakes on 1855. something aint right? Did someone machine the outer or separator plates too thin? That is about all it could be. I see the piece of fiber glued to the piston, so that isn't it. I would compare parts with the other side. Posted: Thu Jan 10, 2019 5:13 pm Post subject: Re: Brakes on 1855. something aint right? (quoted from post at 17:36:01 01/10/19) Did someone machine the outer or separator plates too thin? That is about all it could be. I see the piece of fiber glued to the piston, so that isn't it. I would compare parts with the other side. Both sides are identical in measurements. Regardless of the internal brake parts is the fact that the brake pistons have a maximal travel of only 3/16' from all the way retracted till it bottoms out against the bull pinion. 1/16th of that travel is the necessary brake disc release clearance, which leaves only 1/8" to wear away on the discs before the piston hits the pinion,...which is not very much IMO. New discs are just a wee bit over 1/2' thick. Posted: Thu Jan 10, 2019 5:45 pm Post subject: Re: Brakes on 1855. something aint right? they would go, they couldn't go all the way...new calipers were required. complicated and loose is how I'd expect them to be. Posted: Thu Jan 10, 2019 7:44 pm Post subject: Re: Brakes on 1855. something aint right? I have not done one of these for a long time! I suggest that you go to agcopartsbook online and look up the 1855. Page 113 items 28 and 34. Maybe someone else has miss matched these parts? Could change how many shims are under the housing. Posted: Thu Jan 10, 2019 8:17 pm Post subject: Re: Brakes on 1855. something aint right? (quoted from post at 20:44:23 01/10/19) I have not done one of these for a long time! I suggest that you go to agcopartsbook online and look up the 1855. Page 113 items 28 and 34. Maybe someone else has miss matched these parts? Could change how many shims are under the housing. I have owned this tractor for 32 years and nothing has ever been done to the brakes. Yes shim packs behind the brake/pinion housing will affect pinion to brake piston distance but that cannot be altered as the shim packs control differential/bull pinion end play. Posted: Thu Jan 10, 2019 9:07 pm Post subject: Re: Brakes on 1855. something aint right? That's good that you know that no one else has been into it. 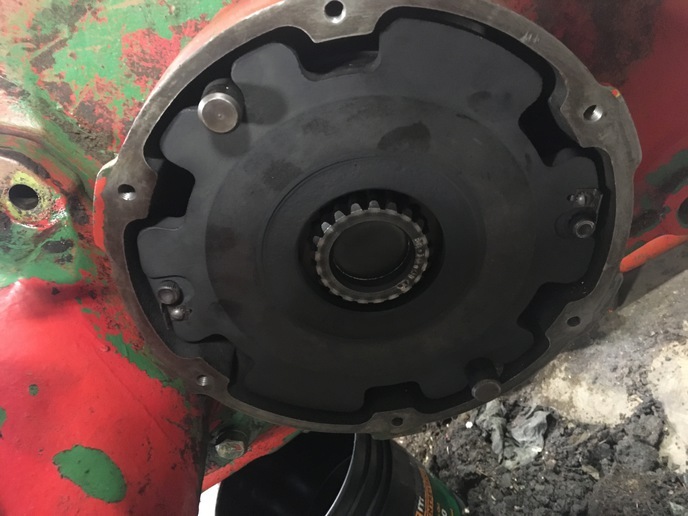 Just curious does the parts book you have show two different inner bearings depending on serial number of your tractor. Maybe it got miss matched on the assembly line if it was close to the serial number break. From the picture on the net I am not sure were part 34 goes? Looks like some kind of spacer. I know what you mean about the shims under the housing as they are how you set the preload on the ring gear carrier. But different bearing sets may have a different overall thickness. A thicker bearing set would require more shims and give you more clearance. I have seen brake disc so worn that the piston came out of the bore enough to let the oring leak. But I don't remember if it had rubbed on the bull pinion. Question, If you place a straight edge over the brake housing and measure the distance to the bull pinion. Is it the same on both sides of the transmission? Just trying to help. Posted: Fri Jan 11, 2019 4:40 am Post subject: Re: Brakes on 1855. something aint right? Posted: Fri Jan 11, 2019 9:30 am Post subject: Re: Brakes on 1855. something aint right? 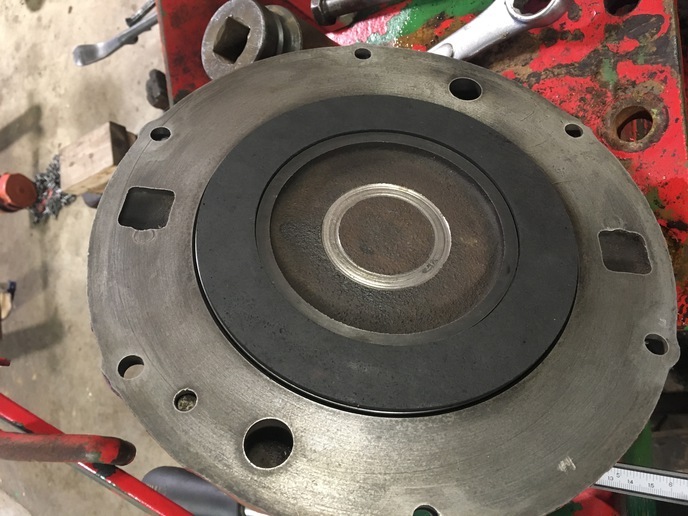 # 34 is an fiber insulator that goes between the brake disc and the adjuster plate. The 0 rings in the piston housings have been replaced and everything looks fine in there. Bull pinion face to end of housing distance are within a couple thou of each other. Differential carrier and crown/pinion backlash have been reset to factory specs which required removal of 1 shim each side. AFAIAC the only way to increase piston travel is to machine the face of the piston back a bit where it contacts the bull gear but there ain't enough meat Imo to do that safely without risking piston integrity. Posted: Fri Jan 11, 2019 9:34 am Post subject: Re: Brakes on 1855. something aint right? Posted: Fri Jan 11, 2019 2:04 pm Post subject: Re: Brakes on 1855. something aint right? Posted: Fri Jan 11, 2019 3:25 pm Post subject: Re: Brakes on 1855. something aint right? Yep, both piston were hitting the pinions but new brake discs solved the problem for now. The as you call it.. the friction discs.. are in my case not bonded to the pistons. as for the part # I relied on the # Tractorderic posted but it could be #10,..I did not verify. All the part #'s on the pinion,brake housing, brake parts and cover are the same as listed in the 1855 parts book I have.